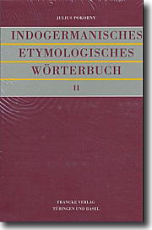 The Indogermanisches Etymologisches Wörterbuch, by the Jewish-Czech scholar Julius Pokorny, was published in 1959. The work is now slightly outdated, especially as it was conservative even at the time Pokorny wrote it, ignoring the laryngeal theory, and hardly including any Tocharian or Anatolian material. But there exists no more modern and updated etymological dictionary of the Indo-European languages, so it is still of interest to scholars. You can comment on this work in the section Reader Reviews of the Late Indo-European dictionary by Fernando López-Menchero. 1 June 2011 :: (v. 2.0) New Version directly from StarLing, without additions.